Very nice article ! really good info . Thanks alot! Toires (Florian Seriot) is definitely one of the most talented artists we have out there. He is a specialist in making Arabic influenced chill out music. He mixes ethnic vocals and instruments with modern electronic dub and ambient. Now he is back with his fourth album, now on a new label called Hoots records, which is a kind of sub label of Montera Music. This is actually an album full of remixes he has done of other artists and tracks by Toires remixed by other artists. First out is a track originally made by someone called Prem Joshua, but here we get a remix by Toires. This is actually one of the most beautiful chilled Arabic influenced tracks I have ever heard! Totally slow, mystic track, with some incredibly beautiful flute. A track I will for sure play a lot this summer. Totally relaxing from beginning to end. Track 2 is a nice Arabic track originally made by Omar Faruk Tekbilek and Steve Shenan. This one was originally released on an album called Alif in 2001, but the first time I heard it was on a very strong Arabic compilation called Arabesque 2, surprisingly released on the techno label React Records the same year. Here we get some beautiful dominating vocals and a nice melancholic melody. Very Arabic sound all the way through with relaxing drums and flute. I have to admit that I prefer the original version of this track, but this sounds really good too. Track 3 is a track originally made by Irina Mikhailova and Todd Christensen, here remixed by Toires in a Frisco mix. Irina is originally from Russia and has become a very famous world music singer, and is also involved in projects like Medicine Drum, Aba Structure and Kaya Project. Here she is back with her beautiful Ethnic voice. A beautiful mix of dubby beats, tribal drums and the relaxing vocals. Track 4 is a track originally made by Toires himself called Mustahil. This track was originally released on his album Sanäti on Backroom Beats and Dakini Records in 2002, but here we get a new remix done by French Electroslide. Electroslide did well with their second album called Near Life Experience, released on Backroom Beat Recordings in 2002. They like to ad a little bit of jazzy vibes. You get some deep, dubby beats, some trumpet and chilled guitar. Really nice! Track 5 is a collaboration between Gator Dash (Thomas Henry) and Toires. Then it is remixed by Toires again. Here they jump right over to a totally Jamaican vibe, with reggae sounds and dubby smoked out beats. So if you are into some reggae influenced dub, this one will probably fit your taste. Personally I think this kind of dub easily becomes a bit flat. Then we get the classic track called Kia, originally released on Toires second album Oued on Toires Records in 2000. 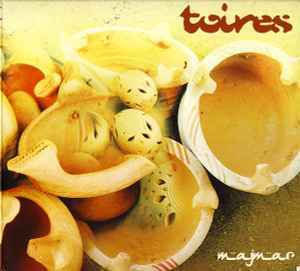 One of my all time favourite tracks by Toires, which brings out some really good memories from Morocco when he played it live in the desert at new years 2001. Here we get an interesting remix done by Digital Mystery Tour, which is an exciting collaboration between Stephan Holweck (Total Eclipse) and Toires. Digital Mystery Tour released a strong album on Twisted Records in 2001. The version we get here is very different. You get some sort of industrial, groovy vibe, still with that beautiful, mystic, Moroccan feeling. Track 7 is another track from the Oued album called Azif Laile. Here we get a remix by someone called Namgyal Gruz. This is a pretty nice version with some atmospheric floating electronic vibes, but I prefer the original. Then we get another track in the collaboration between Gator Dash and Toires, then remixed again by Toires. This is a funky dub track, with playful bass and funky sounds. Very relaxing track, perfect for chilling out in the sun. You get some very Jamaican vibes with this one too. Track 9 is a track by Digital Mystery Tour I haven’t heard before (not on the DMT album). Toires gives us his remix of it. This has some really funky guitar sound, and some kind of housy beats. Pretty cool, but not among the best tracks on this album. Track 10 is another track with Irina and Todd. Toires gives us his On The Pillow version. It’s a floating track with the beautiful voice of Irina. Surprisingly, this is a drum’n’bass track, with drifting jungle rhythms. With this track, you also get another big surprise. A hidden track! If you wait for several minutes, it will start. This is actually the eleventh track on this album, so it’s pretty weird that it is hidden. Here we get another favourite of mine, which is the Tali track from the Oued album. It is remixed by someone called Radiobomb. Now it has suddenly become a groovy drum’n’bass track. The type of jungle you will hear at a drum’n’bass party. I prefer the original, but this is a pretty cool version too if you like drum’n’bass. I was hoping for an album full of new Toires tracks, and that’s what we nearly get here since most of the tracks are very well remixed. Definitely good to hear some music from this guy again, and I will for sure play it a lot. Recommended!